The new and improved Asana for Slack integration will ensure that your team can work seamlessly between Asana and Slack, without having to constantly switch tools. 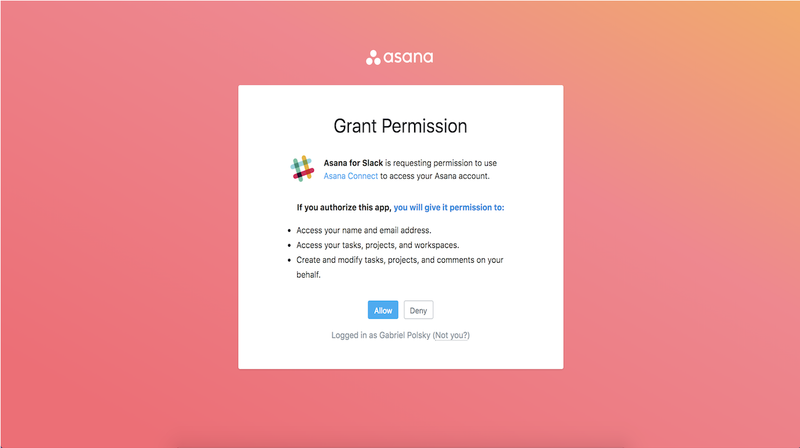 To get started, download the Asana for Slack app. Log into Slack and follow prompts from the Asana Slackbot to authenticate your Asana account, allowing Asana to send information to Slack. If someone in your organization has already installed the integration you might have received a prompt to re-authorize your Asana in Slack. By doing this you’ll be able take advantage of all the new features. If you receive a message indicating that you are not authorized to install Asana, please contact your admin and ask them to approve the app for your Workspace. The Asana for Slack integration is different than the previous Asana app and we will be deprecating the older version in due course. We will import any configurations you had set up from the old app to the new Asana for Slack app. To learn how to set up linked project configurations, see Linked Project Configurations below. 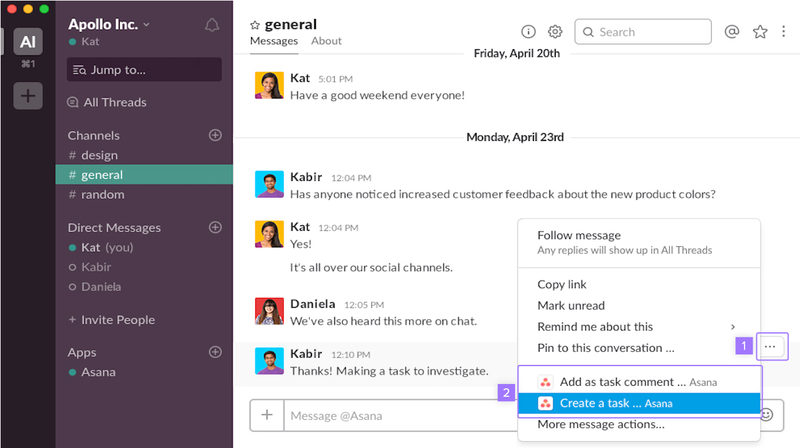 The fastest way to onboard your team is to paste a link to an Asana task in Slack. Ask your teammates to click the “More actions..” drop down menu and select “Like this task.” By interacting with the task, they’ll receive the re-authorization message. Once they re-authorize, the new Asana for Slack will replace the old version. If your unfurls and slash commands have stopped working and you are prompted to authorize the new integration, someone in your Slack team already installed the new app. You can authorize the new app in order to start using slash commands and unfurls once again. We will import your project channel configs from the old app to the new app and you will receive notifications in the same channels you used to in the new format. If you have authorized the new app, but your channels are now receiving both new and old notifications, it may be the case that the old app has not been deauthorized yet. You can do fix this by accessing your profile settings in Asana, navigate to the Apps tab and deauthorize the old version of the app. Slack needs to give our app access to channels. We recommend users choose “all public channels”. This setting is only available during the first install. 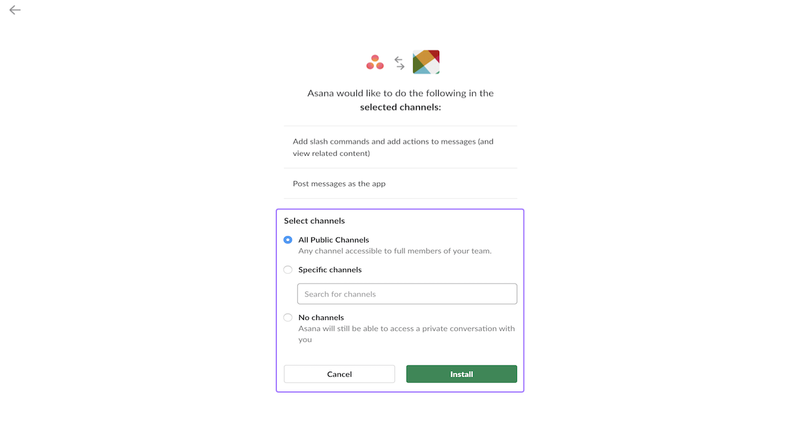 After this choice is made, the app can still be added to private channels and DMs (or public channels if “All Public Channels” is not selected) by typing /asana in the channel. 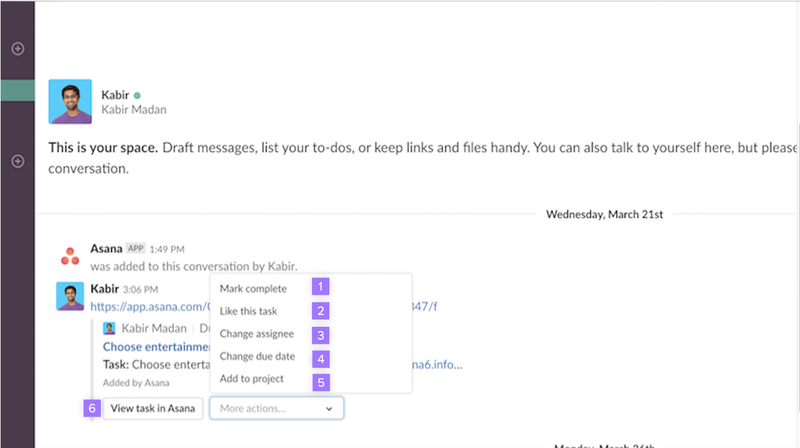 The Asana for Slack integration allows you to turn Slack messages into tasks, take action on tasks from within Slack, or create a new task without leaving Slack. Task specific actions are also available via notifications in your personal or project channels. Capture conversations in Slack and turn them into a task, or add the conversation to a task. In Slack, select the conversation. Click the more mesasages button and select either Create a task or Add to task. A link will be created in the Asana task so that you can re-access the Slack conversation for further context. 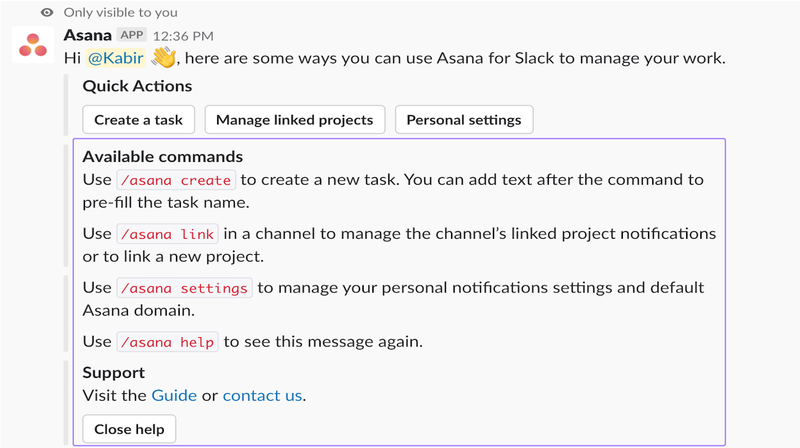 Paste a link to an Asana task in Slack and the task will become actionable from within Slack via a dialogue box and dropdown menus. Please note that if you share a task that is in a private project with a user that is not a project Member, they will not be able to make edits and be told to request access from the project owner. In addition, if you paste a link to a private task, or are sent a private task link, that task description will not unfurl. 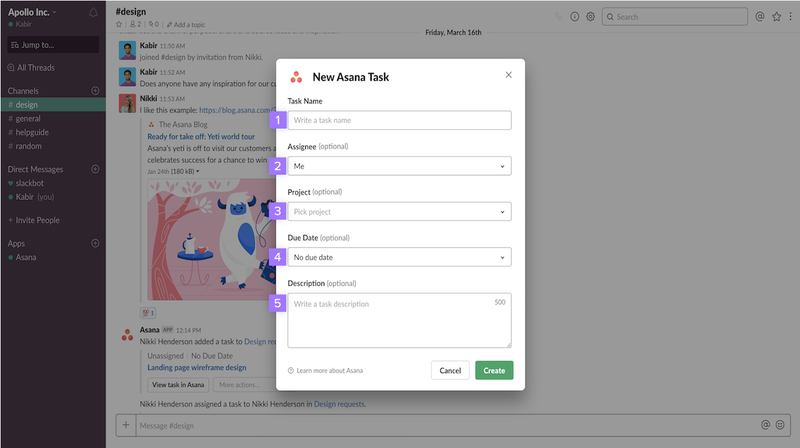 Type /asana create to create a task in Asana without leaving Slack. Personal notifications will be delivered to your personal Asana channel, found under the Apps section in the bottom left of your Slack Sidebar. At any time you can manage your personal notifications by typing /asana settings in Slack for options to turn notifications off or on, change your default domain, or deauthorize your account. To set up notifications for a channel, first make sure you’re in the channel you’re setting up notifications for. Then type /asana link and you’ll see the option to choose and connect your project to the channel. You can also use /asana link to turn off channel notifications.